Italian newspapers have recently been full of reports of countless rickety boats conveying thousands of desperate migrants to its shores. Since the beginning of the year, over 38,000 irregular migrants have arrived in Italy, most of them coming ashore on the tiny island of Lampedusa south of Sicily. This is a significant jump from the 4,290 who made the crossing during the same period in 2013, but Italian officials have suggested that it represents only the tip of the iceberg. Last month, the head of Italy’s Immigration and Border Police agency was widely quoted in the media telling a parliamentary committee that 800,000 more migrants were poised to depart the North African coast for Europe, a figure which he later admitted was “not a concrete projection”. While worries in Italy and throughout the European Union are focused on how many more migrants will come during the usually busier summer months and where they will go, a small number of researchers are trying to understand what has prompted the surge in migrants using this route and where they have come from. According to Italy’s Interior Ministry, 31 percent of the sea arrivals so far this year were Eritrean, a significant increase from previous years. Another 14 percent were Syrian while other nationalities include Somalis, Ethiopians, Sudanese and West Africans from countries including Mali, Nigeria and Senegal. The vast majority of the boats are departing from Libya where smugglers have taken advantage of a security vacuum created by the fall of Muammar Qaddafi’s regime in 2011 to establish routes for smuggling migrants and illicit goods from the country’s southern frontiers to its northern coastal towns. A recently launched report by the Nairobi-based Regional Mixed Migration Secretariat (RMMS) and the Danish Refugee Council examines evidence that migrants and asylum seekers from the Horn of Africa are increasingly willing to undertake the risky journey to Libya and then Europe as previously popular routes to Saudi Arabia via Yemen and to Israel via Egypt have become largely closed to them. The authors suggest that the flow of asylum seekers from Eritrea, Somalia and Sudan who are “Going West” to Libya and Europe is increasing rapidly, despite the enormous risks associated with this route. “We can’t say for sure how many [migrants] are in Libya. We can say for sure the numbers are increasing,” said Melissa Phillips, a researcher with RMMS who until recently was a senior programme officer with the Danish Refugee Council in Libya. “There’s an unknown number of people who don’t make it to their intended dream [destination] whether it be to parts of Libya to work or to Europe,” she added. According to the UN Refugee Agency (UNHCR), more than 170 migrants have died since the beginning of 2014 trying to reach Europe by sea. How many died of thirst or hunger while crossing the Sahara is unknown, but the RMMS report describes the Sahara crossing as “even more dangerous” than the Mediterranean one. In just one incident in April, Sudanese Armed Forces discovered 600 mostly Eritrean and Ethiopian migrants who had been abandoned by their smuggler near the Libyan border. Ten had died of hunger and thirst before the group was rescued. Many of the migrants interviewed for the RMMS report recounted how members of the groups they were travelling with had died from lack of food or water during desert crossings. Their ordeal rarely ended after entering Libya. The country’s lack of an asylum system means that asylum seekers and refugees are usually viewed as irregular migrants. Although asylum seekers can register with UNHCR, the agency has no official status in Libya and the document it issues to asylum seekers is not universally recognized by Libyan authorities. Asylum seekers interviewed for a January 2014 report by Jesuit Refugee Service Malta, described living in constant fear of being arrested and indefinitely detained by Libya’s armed forces or by one of the militias that control large parts of the country. In some cases their captors were kidnappers who demanded exorbitant ransoms in return for their release. Conditions even in the state-run detention centres are extremely poor and medical care is usually unavailable. A survey of about 1,000 migrants conducted by the Danish Refugee Council late last year found that West African migrants in particular often wanted to remain in Libya to work and support their families back home, but that prevailing insecurity as well as increasingly difficult living and working conditions forced some of them to consider moving on to Europe. Following a shipwreck that claimed the lives of more 350 asylum seekers a short distance from Lampedusa in October 2013, the Italian Navy and Coast Guard launched Operation Mare Nostrum to intercept and rescue migrants from unseaworthy boats and prevent further tragedies. 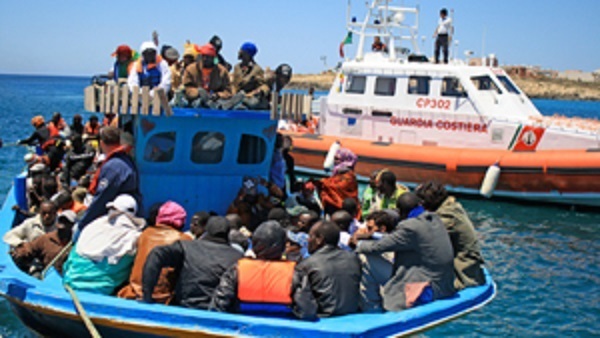 The mission has undoubtedly saved lives with more than 43,000 people rescued by the fleet’s five vessels during the past seven months, but anti-immigrant groups in Italy have complained about the cost to tax payers and argued that, by reducing the risk of the crossing, it is encouraging more migrants to make the journey. Recently Italy’s Interior Minister threatened to release migrants seeking asylum to other countries unless it receives more EU assistance to foot the cost of rescuing and processing migrants. Meanwhile, refugee and migrant rights groups argue that Europe’s focus on intercepting and rescuing migrants is misplaced. They point out that migrants, many of them fleeing persecution and conflict in their home countries, would not undertake such risky journeys if legal means were available for them to come to Europe. They have called for European countries to significantly increase the numbers of refugees they accept for resettlement, to relax the rules governing family reunification and to make it possible to apply for asylum or humanitarian visas via embassies in countries of origin or in third countries. Member states are funding a US$41 million mission to help Libya better secure and manage its borders through the EU Border Assistance Mission (EUBAM) to Libya. However, the mission, now entering its second year, has been severely constrained by Libya’s unstable security environment and its lack of a strong central government. Insecurity in the south has prevented mission staff from visiting the southern border area where the majority of illegal entries into the country occur. Much of the mission’s work has instead focused on training coastguards to rescue and apprehend migrants attempting to leave Libya by boat. While part of that training includes talking about the importance of not violating migrants’ human rights and providing medical care, EUBAM’s mandate does not extend to the detention of migrants that usually follows their interception. EUBAM was launched in response to a request by the Libyan government for assistance, but it is clearly also viewed as serving the interests of EU member states who would prefer that fewer migrants reach their borders. Phillips agreed that trying to prevent people from reaching Europe was the wrong approach. “The problem is being looked at very much from a destination approach… but unless we look at transit and origin [countries], we’re only looking at one part of the story,” she told IRIN.